Bienvenido to the restaurant that captures the essence and flavour of Latin American cuisine: Cantina del Centro. Loosely translated as “downtown restaurant,” the popular eating spot is known for its array of Mexican food. Producing everything in-house, the galley-style bar serves up its tacos on small plates reflecting the vivid colors of the Mexican tile floor. They are not short on drink selection with over 70 varieties of tequila and mezcal on the list. 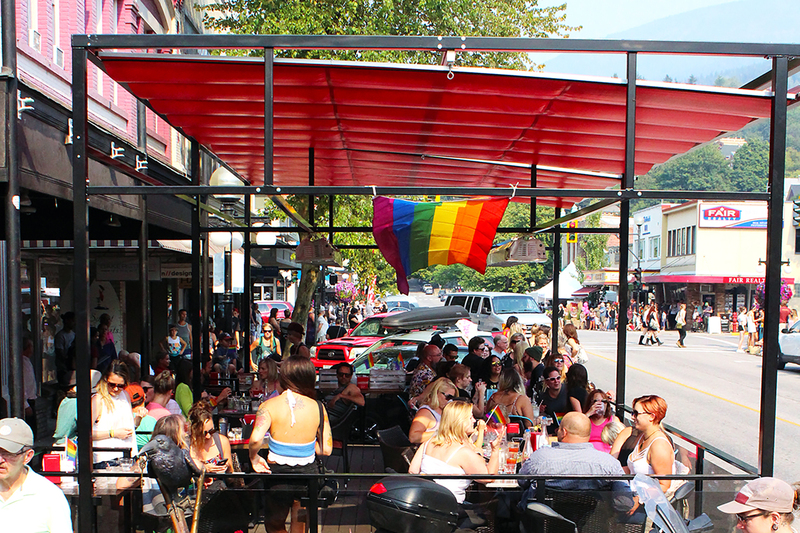 Located in Nelson, BC, this bright and vibrant eatery is jammed with diners seven days a week. 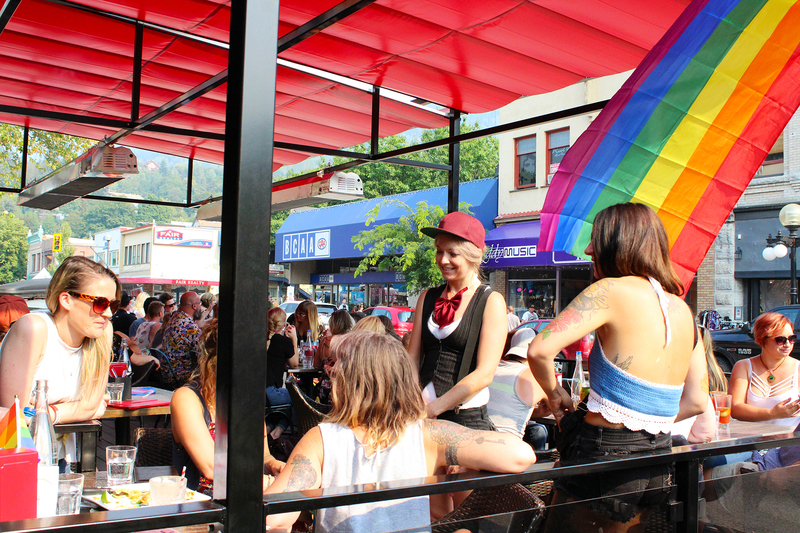 If it isn’t packed from their weekly Cantina Sessions, there are a variety of other cultural events that draw people to its doors. 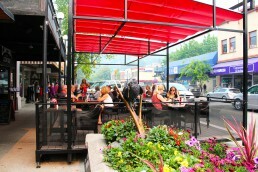 During the warmer months, the restaurant sets up an outdoor patio across the sidewalk. This helps to accommodate the overflow while offering the regulars a change of scenery. When the restaurant moved to a bigger space next door, they wanted to maintain this formula, while upsizing their offering. 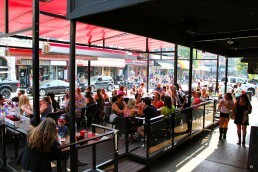 With more space on the inside, Cantina del Centro sought to double the effort via patio expansion. 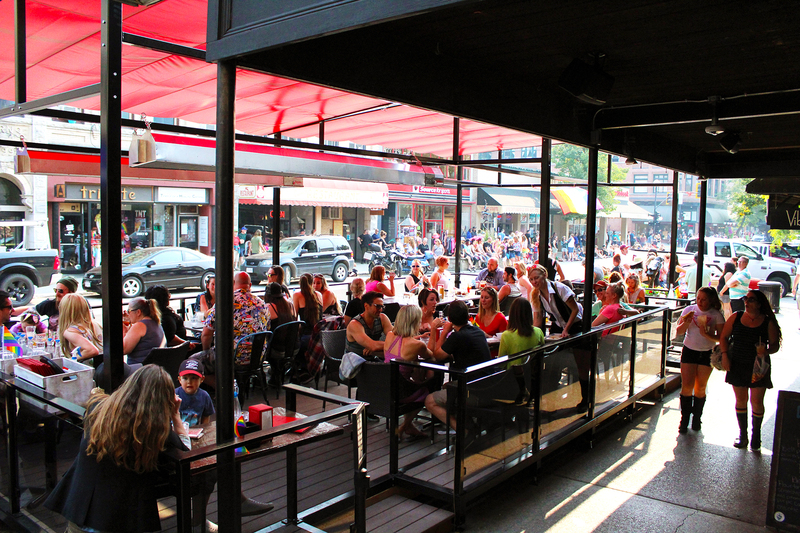 In addition to a larger footprint to accommodate more patrons, the group wanted to capitalize on patio season. For a dynamic solution, they contacted ShadeFX. 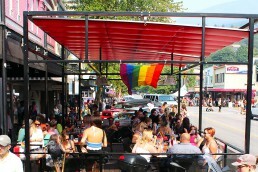 Two 16’x14’ retractable shades were installed over the pop-up patio, covering roughly 450 sq. ft. of the outdoor dining space. Keeping the spicy Latino theme, the restauranteurs opted for a fiery red fabric. By choosing a fire-retardant fabric line, Cantina del Centro was able to install large natural gas heaters on their structure. 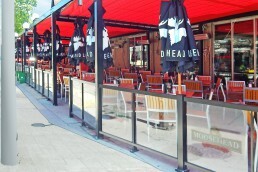 “The retractable canopy system that we ordered from ShadeFX has been instrumental of our new patio build with the move to a new restaurant space last summer. 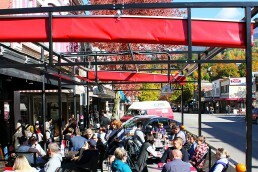 The kissing canopy’s orientation allows for quick manual extension/retraction that our servers are able to operate quite easily, allowing for direct sunlight when wanted, or able to provide shade from the hot sun or shelter from light rains for our 38-seat deck patio from May through November. 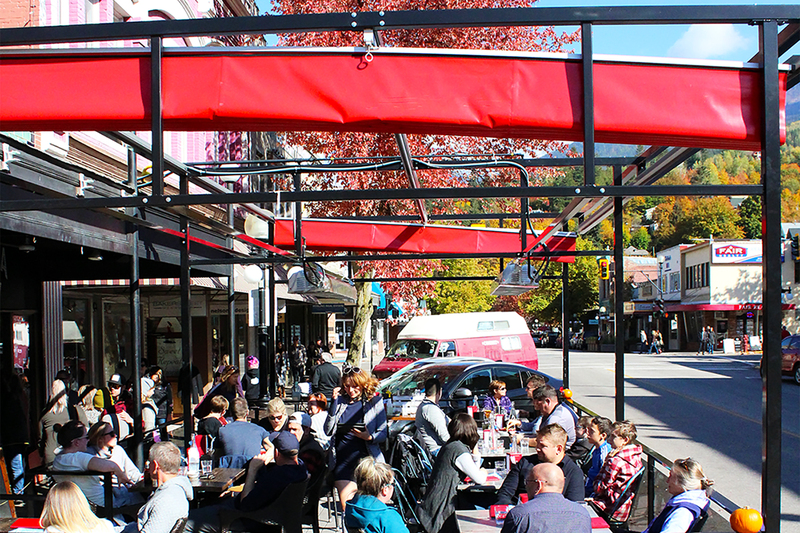 The new covered patio keeps guests warm and protected from the elements spring through fall, extending patio season for at least three additional months. Make the most out of your patio season. Find out how. Two 16’x14’ retractable shades were installed over the pop-up patio, covering roughly 450 sq. 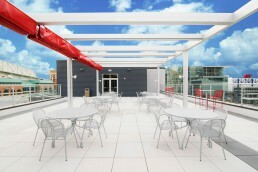 ft. of the outdoor dining space. Keeping within the spicy Latino theme, the restauranteurs opted for a fiery red fabric. 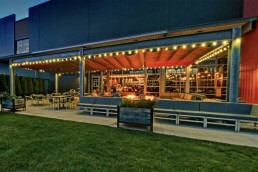 By choosing a fire-retardant fabric line, Cantina del Centro was able to install large natural gas heaters on their structure.